The Ohuhu bicycle cover is one of the best bicycle covers for outdoors that gives you superior coverage at an affordable price. This bicycle cover is made from durable 210T nylon that does not puncture easily. The material though not as durable as the 600D polyester, has an ideal density and feels sturdy enough to last for a couple of years. Furthermore, since the cover is made of nylon, it I, therefore, waterproof making it an ideal outdoor bike cover. The silver side of this bicycle cover provides protection from damaging UV rays, thus the OHUHU cover not only serves you during the rain but also when the sun is scorching hot. You should consider the following factors before buying a cover. In most cases, the dust covers are lighter and intended for indoor use. They are mainly designed to protect the bike from damage or scratch and ensure that you do not get smeared with chain oil. Outdoor covers, on the other hand, are more durable than dust bicycle covers and tend to be made of high-quality material. They are well designed to offer protection from UV rays and are also waterproof and rip-resistant. Generally, an outdoor cover is the ideal choice of a bicycle cover since it can offer both indoor and outdoor protection. For instance, the Ohuhu bicycle cover can serve the two purposes very well. As much as having a large bike cover sounds well, you also do not want a cumbersome cover that will make it hand to carry with you. Be sure to go for a cover that easily folds to a compact and portable size, without compromising on the size of the bike cover. What makes the Ohuhu bike cover one of the best road bike covers, is it 210T nylon material. This material is ideal for mountain bikes and road bikes that do not necessarily have to be stored in the garage. Thus the cover offers superb outdoor protection from adverse weather conditions such as heat from the sun, rain, and snow. The material also is sturdy and has enough density for prolonged durability. One of the most unique features that sets this bicycle cover apart from the rest, is the specially designed and adjustable buckle at the bottom. The buckle ensures the bicycle cover fits perfectly on the bike as well as ensuring the cover remain stable even when the wind is blowing strongly. The buckle also prevents corrosion on your valuable bike. As part of the things you should consider when buying bicycle cover, the Ohuhu bicycle cover manufacturers had this in mind when designing this bike cover. A good bike cover should cover ‘all’ of the bike without leaving any parts exposed. This means that the bike cover should not only cover the top of the bike but also cover the bottom completely, including the wheels. With a dimension of 78.7 inches long by 43.3 inches wide by 27.5 inches tall; this bicycle cover can comfortably accommodate almost all mountain bikes and road bikes. As long as the wheel is below 29 inches, you should be okay. Ventilation in a bike’s cover is essential to ensure the bike gets some air while under the cover. This one of the features most bike owners tend to overlook and in most cases, some manufacturers do not include these ventilation holes. The like the one on this bike cover, allow for aeration thus reduce sweat build up and avoid moisture, especially on high-density materials. The eyelets can also be used to secure your bike by tying a bike’s part through such holes. It is, therefore, a good idea to go for a bike cover with eyelet holes to enjoy these benefits. In most cases when you are commuting with your bike, you might consider carrying the bike cover with you. 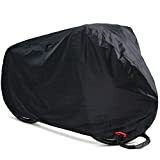 Or whether you are traveling by car to your vacation destination, say a camp may be, you will need a bike cover that is easy to fold and pack into your luggage. The compact size of the Ohuhu bike cover makes it easier for you to travel by the bike cover, thus you won’t ever have to leave your bike uncovered. Keeping your bike safe from possible theft should also be your concern as much as protecting it from harsh weather conditions. This is because in most cases, after commuting with your bike you leave it outside in the parking area, where anything can happen, even theft in this case. 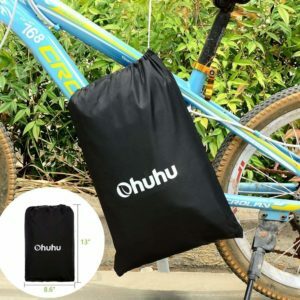 The Ohuhu bike cover anti-theft lock hole is specially designed they are strong enough to be used with cable or chain thus keeping your bike secure at all times. Finally, you agree with us that this waterproof and high-quality cover is perfect for both road and hybrid bicycle that you’ve own. Moreover, this bicycle cover comes with a wide dimension of 78.7 x 43.3 x 27.5 inch that covers a long area. That’s why people like it and buy it for their indoor and outdoor use. For more check top-rated bike covers here.